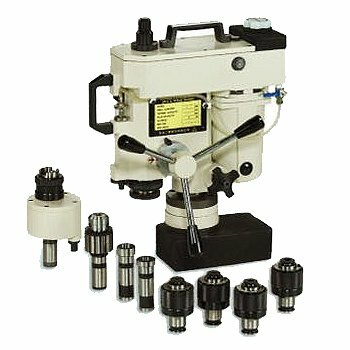 Drill sleeves, borer holder and tapper set are all rapid adaptor design,convenient for replacement of cutters and increasing efficiency. It is integrated with machine body, more stable. This could reduce damage resulting from out going impact. The most suitable for drilling or tapping on heavy work-pieces that is difficult to be moved, such as production of machine tools, steel skeleton of building, H type steel, big steel plate and steam furnace..etc. Hole Capacity - - 5/8"~1-9/16"
* These specifications and shape may be changed for improvement without prior notice.